“I did not want anyone to ever feel as disorientated and bewildered as I did.” – Christine Durham. 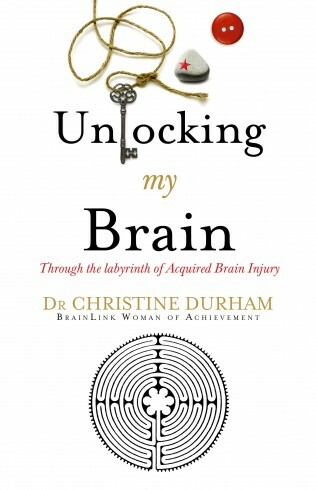 Unlocking my Brain; Through the labyrinth of Acquired Brain Injury brings to life Christine Durham’s personal experience of brain injury – from being unable to walk, talk, see or think clearly, to how she regained her life, her thoughts and her confidence. In 1991 Christine was involved in a horrific car accident and suffered extensive injuries including brain injury. Unlocking my Brain is a guide for others with brain injury to help them understand the daily experience of ABI. It not only shows not only the plasticity of the human brain, but also the plasticity of the human spirit. Brain injury does not just damage a person’s brain and body (as recognized by the medical profession) it also damages a person’s beliefs, hope, honour, trust, safety and security. This book acts as reference point to help professionals understand the backstory of their clients. Christine Durham has since gone on to complete some amazing achievements. After completing a PhD in Health Science, Christine started pubic speaking on the international circuit and is known for her contribution to the brain injury community.